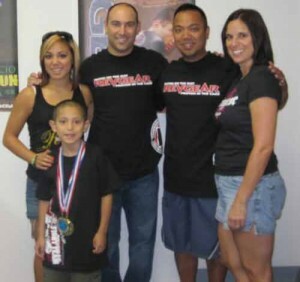 July 31st - August 1st, 2010: Revgear's young MMA standout Dominic Batara, 7, competed at the 3rd Annual Brazilian Jiu Jitsu World Championships in Riverside, CA. Over 400 competitors from all across the US were present to test their skills against the nation's top elite youth grapplers. Dominic did not disappoint, taking home gold and 1st place finishes, in both Gi and No-Gi divisions, 49 lbs and under. Dominic continued his dominant tournament prowess not giving up a single point the entire weekend while submitting all of his opponents. The 2-day, single elimination style format fit Dom well as he did not lose a single fight during both days of competition. We are very proud of you, Dominic! While in California, Dominic Batara and his family visited Revgear. Photo: Dominic and his family at Revgear with Paul Reavlin.